If you use a channel partner integration, your workflow may be slightly different. Please reach out your partner's support team for clarification. Every user is assigned a Role when their account is created. These roles determine exactly which functions the user is able to perform. Certain functions such as removing data, and editing the account are restricted to Administrator and Process Managers. There are currently 4 main Roles, and depending on your plan you may have access to 2. Administrators have the highest level of capability. This includes the ability to manage company information, billing and users. They can also manage templates, reports and other operations related items. Process Managers have the ability to manage company operations with templates, inspections and reports. Large companies may have many Process Managers. Inspectors can perform inspections and share reports. 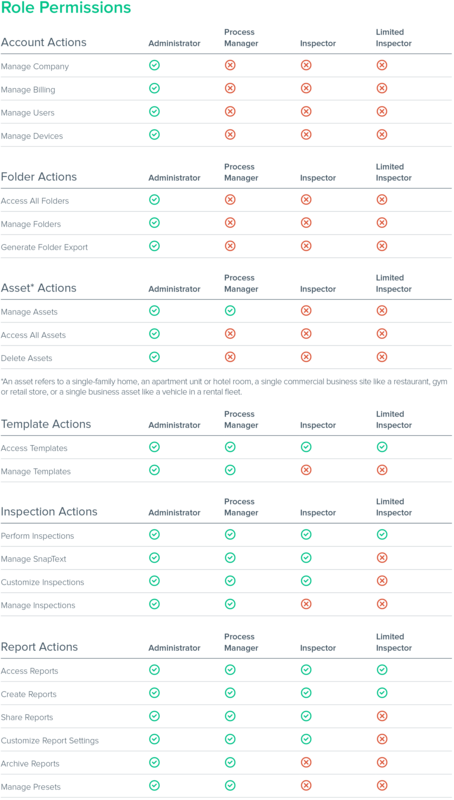 Limited Inspectors can perform inspections and generate reports, but do not possess the ability to customize or share them. the change will be applied immediately.